Quirky batik capris with elasticated hem and waist. 100% Cotton. Concealed Side Zip. Elasticated Waist Band At Back. Hand Wash Separately. Do Not Bleach. Iron On Reverse. Due To Nature Of Fabric, Colour May Run For First Few Washes. Size Runs Large. Select One Size Down. 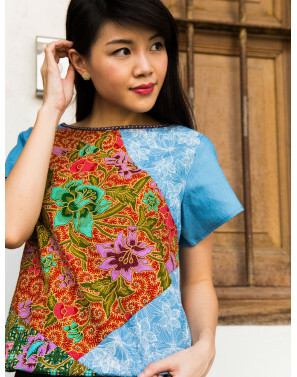 BATIK IS UNIQUE. LIVE CHAT TO SELECT BEFORE PURCHASING. Cotton eyelet pants with drawstring. 100% Cotton. Cotton Lined. Side Zip. Hand Wash Separately. Do Not Bleach. S Fits UK 6-10. M Fits UK 8-14. Vibrant oriental print harem pants on a flowy fabric. Polyester Blend. Back Elastic. Hand Wash Separately. Do Not Bleach. Warm Iron. S Fits UK 6-10. M Fits UK 10-14. Modern interpretation of the sarong, with lace insert. 100% Cotton. Side Zip. Hand Wash Cold. Do Not Bleach. Iron On Reverse. Due To Nature Of Fabric, Colour May Run For First Few Washes. True To Size. BATIK PRINT/COLOUR IS UNIQUE. LIVE CHAT TO SELECT BEFORE PURCHASING. Classic tapered skirt with front slit and front pocket. Traditional or modern, depends on your mood. 100% Cotton. Concealed Side Zip. Elasticated Waist Band At Back. Hand Wash Separately. Do Not Bleach. Iron On Reverse. Due To Nature Of Fabric, Colour May Run For First Few Washes. Regular Size. BATIK IS UNIQUE. LIVE CHAT TO SELECT BEFORE PURCHASING. Fun midi skirt with front slits and decorating buttons. 100% Cotton. Cotton Lined. Elastic Back. Slips On. Due To Nature Of Fabric, Colour May Run For First Few Washes. S Fits UK 6-10. M Fits UK 12-14. EVERY PIECE IS UNIQUE. LIVE CHAT TO SELECT BEFORE PURCHASING. Batik patchwork halter with lace trim and keyhole back. 100% Cotton. Back Button Closure. Slips On. Hand Wash Cold. Do Not Bleach. Iron On Reverse. Due To Nature Of Fabric, Colour May Run For First Few Washes. Size Runs Large. Recommend To Select One Size Down. BATIK PRINT/COLOUR IS UNIQUE. LIVE CHAT TO SELECT BEFORE PURCHASING. Batik patchwork panel with printed denim and embroidered collar hem. 100% Cotton. Slips On. Drawstring Waist. Hand Wash Cold. Do Not Bleach. Iron On Reverse. Due To Nature Of Fabric, Colour May Run For First Few Washes. True To Size. BATIK PRINT/COLOUR IS UNIQUE. LIVE CHAT TO SELECT BEFORE PURCHASING.